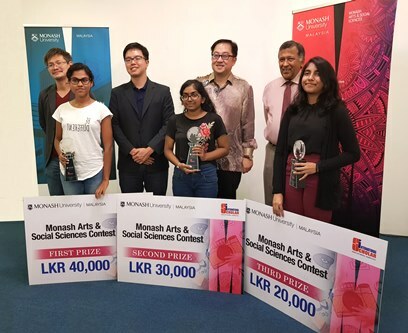 The School of Arts and Social Sciences (SASS) at Monash University Malaysia recently (27 Oct. 2018) teamed up with International Scholar Education Services (ISES) in Colombo, Sri Lanka, to organize a half-day event aimed at introducing the social sciences and humanities to pre-university students. 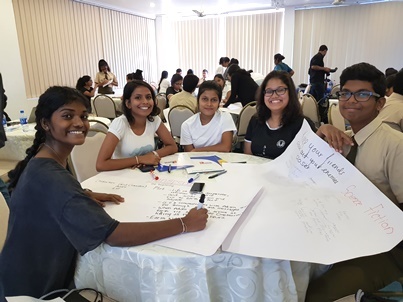 In attendance were thirty-two participants from various colleges, international and national schools such as the British School in Colombo, Bishop’s College, and Devi Balika Vidyalaya, amongst others, who were tasked with two activities for which they could win prizes. The first, a team-oriented undertaking, involved a film-pitch whereby participants must produce an idea for a film according to a designated genre (horror, the superhero film, etc. ), and using a specific prop (a wooden spoon and a clapper board, to name two examples) and a well-known line from a screenplay (“Show me the money”, for instance) as basis. This was followed by a fifty-question quiz, which was also an individual event and whose concerns correspond with those gathered from gender, literary, film, global, and communication and media, studies. Winning members of the first activity comprising Dinuri Risaka, Emara Gnatilake, K. Sasani Hasli Perera, Yousuf Shafeek and Zainab Hamid, were each awarded with a pair of movie-tickets. Meanwhile, the overall winners (based on the two activities’ combined marks) were given individual trophies and cash prizes, with Emara Gunatilake and Arumi Navoja Kumarawadu (both Museaus College) in the positions of second and first runners up (LKR20 000 and 30 000 respectively), and Risaka Fernando (Devi Balika Vidyalaya) taking home the first prize of LKR 40 000. When asked for feedback, the students had very positive things to say about the joint fun-filled and memorable educational event. Rushan Ragunathan of Asian International School, for example, noted how he had initially thought of giving it a miss due to its length but was glad he attended in the end. Zainab Hamid of Ladies’ College echoed a similar sentiment, and added that the event was “helpful and exciting”. 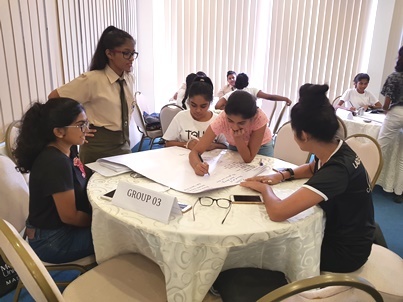 Another participant from Devi Balika Vidyalaya, Ginrui Padukka, further expressed how interesting the competition was, while Shruthi Douglas of Bishop’s College suggested that it should be an annual affair. Representing SASS were Associate Professor Andrew Ng, Dr. Nicholas Chan (both of whom also served as the judges for the film-pitch competition, while the latter further gave an overview of the School and its various programs to the attendees), and Ms. Fong Yew Soon (Operation and Resources Manager), who were assisted by Ms. Charlotte Kong from Marketing (Monash) and the friendly staff of ISES headed by Ms. Wathsala to run the day’s activities. Also presiding were ISES’s CEO, Mr .Keerthi Jayasuriya, and towards the end of the event, His Excellency, Mr. Tan Yang Thai, High Commissioner of Malaysia to Sri Lanka, who graciously agreed to confer the three overall winners their prizes. 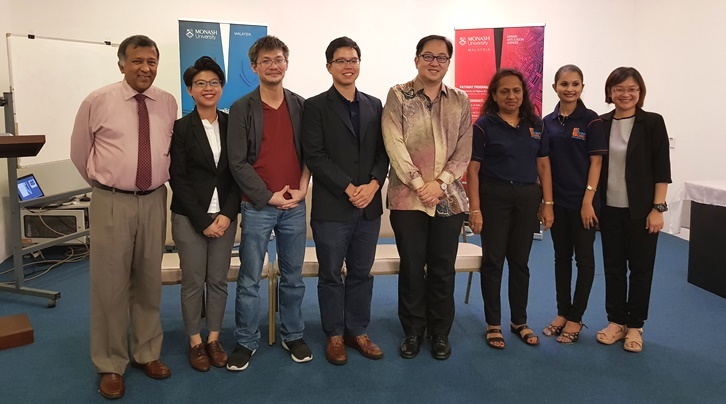 In their respective speeches, Mr. Keerthi expressed his delight in working with SASS and Monash University in general, while Mr. Tan encouraged both institutions to conduct more joint events like the present one in the future to foster stronger educational and cultural ties. Authorised by: Marketing and Future Students. Maintained by: Monash University Malaysia Webmaster Team. Last updated: 09 Nov 2018.